Ileana Oancea (b. 1977) completed the Bucharest National University of Arts in the class of Mircea Spătaru. 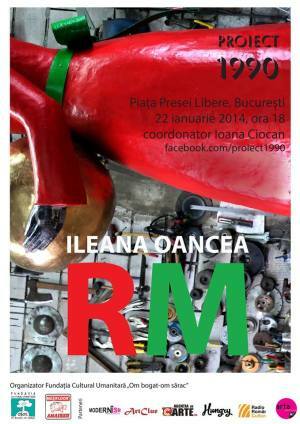 For Project 1990 Ileana Oancea creates RM, a foolish child who enjoys when he has a piece of gold. Ileana Oancea lives and works in Mogoşoaia near Bucharest. Launched in January 2010 "Project 1990" marks a series of events aiming to place contemporary art works in the Free Press Square from Bucharest which had been an empty abandoned space for 20 years. In 1960 a six meter high statue of Lenin by Boris Caragea was placed in the Free Press Square from Bucharest. After the 1989 Romanian Revolution, Lenin's statue was removed (in January 1990) and moved to different locations around the city of Bucharest. The statue plinth remained empty until Ciocan transformed it into a temporary exhibit space in January 2010. So far”Project 1990” included nineteen contemporary artists. "RM @ Project 1990" Art Show in Bucharest. You can get here description, reviews, address, time and details of "RM @ Project 1990" Art Show in Bucharest. Visit Bucharest Tips for more Art Show events in Bucharest!